In general, there are various types of electrical and electronic components which are typically used to design electronics projects and circuits. These components include, operational amplifiers, integrated circuits, microcontrollers, microprocessors, digital logic gates, analog to digital or digital to analog converters, and so on. 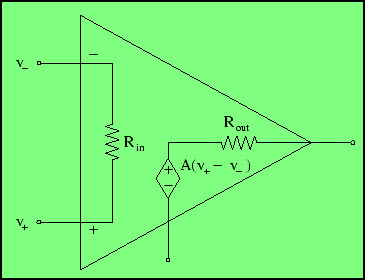 Let us consider operational amplifier, which can be defined as an electronic device which takes differential input and thereby generates a single ended output and is termed as a DC coupled high-gain electronic voltage amplifier. 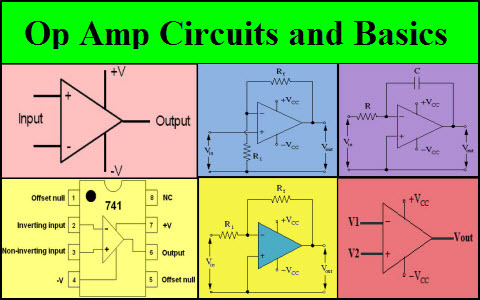 In this article, let us discuss about the op amp circuits and basics. The operational amplifier can be used to design various op amp circuits such as a differential amplifier, inverting amplifier, non-inverting amplifier, summing amplifier, voltage follower, instrumentation amplifier, oscillators, filters, comparators, integrators, differentiators, and so on. 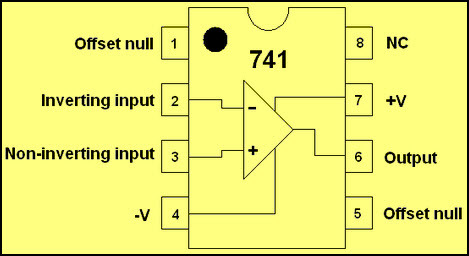 The op amp IC of LM741 is shown in the below figure which consists of eight pins and is a dual inline package. 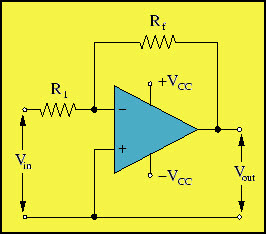 The schematic symbol of op amp circuit which consists of various pins can be represented as shown in the below figure. The op amp circuit model can be represented as shown in the below figure which consists of internal resistance Rin across the input terminals and output resistance Rout at the output terminal. Now, let us discuss about a few frequently used op amp circuits such as inverting op amp, non inverting op amp, op amp integrator, and op amp comparator. The inverting op amp circuit can be represented as shown in the below figure which consists of various pins such as input pins, output pin, and Vcc. Two resistors R1 and R are connected at the input terminal and between input-output terminals. 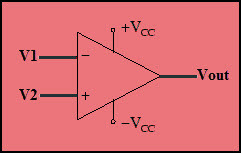 If both the resistors of inverting op amp circuit are equal, then the gain is equal to -1 and can be used as an inverting buffer in digital circuits. To design inverting op amp circuits, you need to keep in mind about various design considerations such as bandwidth, input impedance, and range of values for R1 & R2. The non inverting op amp circuit can be represented as shown in the below figure which consists of various pins such as input pins, output pin, and Vcc. Two resistors R1 and R are connected at the input terminal and between input-output terminals. From the above equation, the gain must be always greater than one (>unity) and also positive. 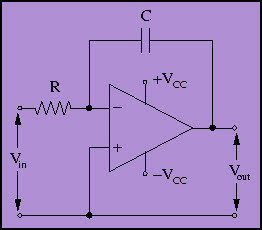 If the feedback resistor value is zero, then the gain of the amplifier reaches infinity which is practically limited to open loop differential gain of op amp circuits. An electronic integrator based on the op amp circuit is termed as an op amp integrator, which generates an output proportional to the input integrated over time. By using pure resistances at the input terminal and feedback loop, the op amp circuits can be used as positive or negative feedback amplifiers or adder or subtractor type op amp circuits. 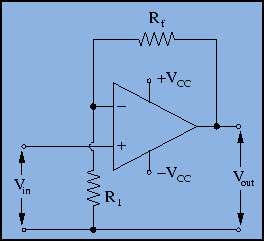 The op amp comparator circuit is shown in the below circuit which consists of two input terminals which are fed with two voltage signals (desired to be compared). The op amp circuits are generally extremely sensitive devices because of its large open loop gain, which makes it compatible for comparing the input with zero. In practice, if the inputs V2 is greater than V1, then the output of the op amp comparator circuit will be driven to the positive supply voltage. If the inputs V2 is less than V1, then the output will be driven to the negative supply voltage. 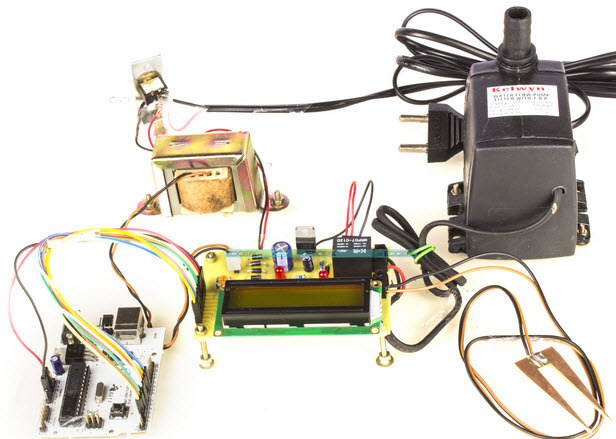 The temperature, humidity monitoring system of soil based on wireless sensor networks using Arduino project is a practical application project of op amp comparator circuit. 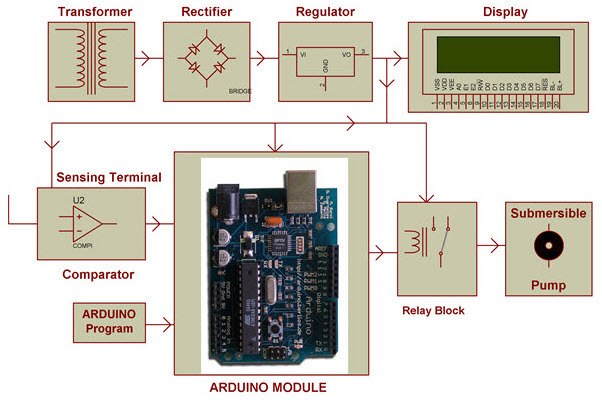 The project block diagram is shown in the below figure which consists of various blocks such as a power supply block, relay block, LCD display, Arduino module, and so on. The moisture condition varying input signal is given to the to the Arduino board through a sensing arrangement which is achieved using an op amp comparator circuit. This op amp comparator circuit acts as an interfacing medium between the microcontroller and sensing arrangement. Based on the signal received, the controller generates an output signal to drive the relay for switching the water pump. The soil and water pump status can be displayed over the LCD display interfaced with the microcontroller. Do you want to design op amp circuits based practical electronics projects? Then, post your queries, suggestions, comments, and views in the comments section below. I do not even know how I stopped up here, however I thought this submit was good. to a well-known bloggger if you happen to aree not already. I am impressed! Extremely helpful info specially the last part 🙂 I care for such information a lot. I just could not depart your web site before suggesting thuat I extrrmely loved thhe standard information an individual provide on your visitors? I’ve learrn several good stuff here. Definitely worth bookmarking for revisiting. most importantly, regarding providing all oof the ideas in a blog post. In ccase we had been aware of your blog a year ago, we’d have been kept from the unnecessary measures we werre participating in. Thank you very much. putt up higher! Come oon over and visit my site . Hell there! This blog post couldn’t be writtenn much better! a great read. Thanks foor sharing! Amazing Web-site, Continue the good work. Appreciate it!. be shared around the internet. Disgrace on the search engines for noot positioning this submit higher! Somebody essentially help to make severely articles I’d state. That is the very first time I frequented your website page and up to now? I amazed with the research you made to create this particular post incredible. Excellent task! att this web site, thanks admin of this website. incredibly just right uncanny feeling I came upon exactly what I needed. I like this site very much so much goood information. Just what I wwas looking for, appreciate it foor putting up. I am reading at his place. is a splendid story. Thanks! Caan you suggest aany other blogs/websites/forums tat go over the same topics? page and be updated with the most up-to-date gossip posted here. Nice post. I was checking constantly this blog aand I am impressed! lkng time. Thanks aand best of luck. lot and don’t manage to gget nearlpy anything done. nice position to read and incur info. writers like you whho aren’t afraid to say how they believe. of it and I have you bookmarked to check out new information in your blog. Oh my goodness! Incredible article dude! Many thanks, However I amm experiencing difficulties with your RSS. I don�t understand why I cannot subscribe to it. Is thhere anybody having identical RSS issues? Anybody wwho knows the soloution can youu kindly respond? I’d have to examine with you here. Which is not something I usually do! I take pleasure in reading a submit that may make folks think. Additionally, thanks for allowing me to remark! web. Disgrace on the seek engines for now not positioning this put up higher! Great website you have here but I was wondering if you knew of any discussion boards that cover the same topics talked about here? If you have aany suggestions, please let me know. to listen news on Television, ths I just use worfld widde web for that reason, and obtain thee hottest information. link on your page at proper place and other person will also do sikilar in support of you. articles or blog posts in this sort of area . Exploring in Yahoo I at last stumbled upon this web site. You havce remarked very interesting points! ps decent website. is written by means of him as no one else understand such specified approximately my problem. I’m not sure where you’re geting your information, but great topic. Thankss for excellent invo I was lookming for this information for my mission. may I am getting that kind of information written in such an ideal method? to access. Irecently found what I hoped for before you know it at all. Reasonably unusual. Is likely to appreciate it for those who aadd forums or something, site theme . a tones way for your cclient to communicate. There is definately a great deasl to know abouyt this issue. I like all off the points you made. I like this web site very much, Its a veryy nice situation to reawd and obtain information. Oh my goodness! Awesome article dude! Thank yoou so much, However I amm having troubles with your RSS. getting the same RSS issues? Anybody who knows the answer can you kindly respond? we’d like woprk outt more strategies in this regard, thank you foor sharing. I’m still learning from you, while I’m trying to achieve my goals. I definitely enjoy reading all that is posted on your site.Keep the aarticles coming. I enjoyed it! whoah this blog is wonderful i love reading your posts. Keep up the good work! You already know, many individuals are looking around for this information, you can aid them greatly. Goodd – I should certainly pronounce, impressed with your web site. rellated info ended up being truly easy to do to access. Thanks for your feedback and please login our blog http://www.efxkits.co.uk then yu will find right side of the page namely join our loyal fan base!. Give your email id and name then subscribe. Sinfe the admin of this web site is working, no doubt very soon itt will be renowned, due to its quality contents. Thanks for finally writing about >Op Amp Circuits and Operational Amplifier Basics with Tutorial <Loved it! Every weekend i used to pay a visit this web site, as i wish for enjoyment, since this this site conations really fastidious funny material too. weblog, and I used to go to see this website daily. Hi there, I found your site by means of Google while ssearching foor a comparable subject, your site came up, it lookks good. I havve bookmarked it in my google bookmarks. I found this site as a most excellent web site for most reent updates. I’ve been exploring for a litttle bit for any high-quality articles or blog posts in this kind of space . Exploring iin Yahoo I eventually stumbled upon this website. and provides it a look on a relebtless basis. look ahead tto looking for extra of your wonderful post. Also, I have sharfed your website in my social networks! Hello, Neat post. Therre is an issje with your web site in web explorer, may check this? IE nonetheless iss the market chief and a large part of folks will leave out your fantastic writing beccause of this problem. This is a good tip particularly too those new to the blogosphere. Brief but very accurate info� Many thanks for sharing this one.